Many practice owners and PT marketers struggle to cross the threshold and develop strong referral relationships with local physicians. It is a delicate balance of communication, planning, and marketing (plus a bit of good luck) that creates the ideal opportunity. Most importantly, building business relationships and networks takes time and patience. You would not go from being strangers to being houseguests with most people—solid relationships (personal or professional) require effort and commitment to starting and maintaining that level of interaction. For the first meeting, the practice owner should personally call to make an appointment to see the physician. The marketing manager should also come along, especially if he or she will be the primary representative for your PT practice. Choose a time that works for the physician and adjust your schedule accordingly. After all, you are the one initiating this process. Do not meet during lunch time. This might be the most convenient time for you (and possibly the doctor), but lunch time is truly personal time. The doctor might be earmarking that hour for personal errands and losing needed time does not make a good first impression. Be realistic with how long you want to meet. Asking for a 15 minute window, when you really need 45 minutes to introduce yourself is not optimal. Or asking for a full hour and taking only 20 minutes might prevent the doctor from accepting another appointment. Call the day of to confirm. Schedules change and it is best to respond with flexibility and choose a convenient time for everyone to meet. 3-5 key talking points that highlight your practice’s history, achievements, and reasons to refer patients to you. A sample (2-4 pieces) of your marketing materials: a new patient packet, newsletter, physician mailer, and practice brochure. Promotional items: prescription pads, pens, water bottles, etc. A treat for the front desk staff: go the healthy route and bring a gift basket with granola bars, natural snacks, or homemade baked goods. After your visit, create a strategy for engaging with the office and physician. Did they seem to operate with online systems? Showcase your website’s online appointment or referral form. Are they active on social media? Follow their accounts for news and updates. Bring a sample of past newsletters to leave in the waiting room. Update your mailing lists with the practice’s information to ensure they receive all direct mail marketing. Do you treat any patients who see the doctor as their PCP? Bring their results and testimonials to showcase your PT and its results. Growing and maintaining a strong referral network can be challenging, especially in today’s healthcare environment. 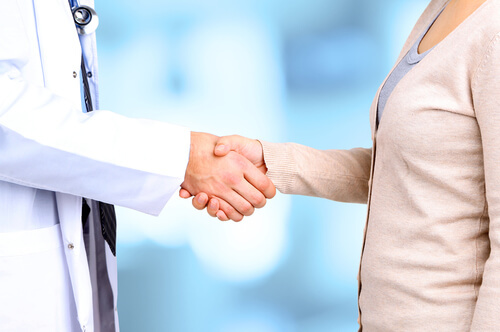 Our sales and account management team knows how to get you in the door and building relationships with physicians’ offices. For personalized consultations and help with marketing to physicians, sign up for our FREE webinar today!